I'm a big fan of raw cabbage, especially red cabbage. It adds a nice crunch to any salad, and it lasts a long time in the fridge, even when shredded. It's also a great addition to tacos. 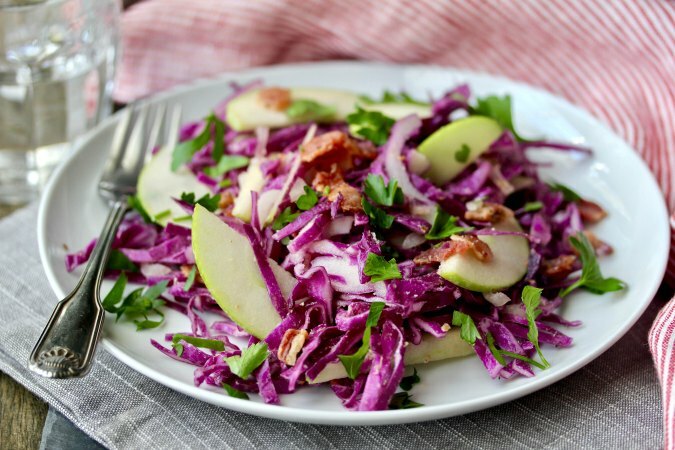 This salad is easy to make ahead or take to a picnic or potluck because the cabbage does not wilt the way lettuce does. To keep the apples from turning brown, I tossed the slices in orange juice before adding them to the salad. You could use any citrus juice, but I like the hint of sweetness that the orange juice adds. This recipe has been inspired by the book Mark Bittman's Kitchen Matrix: More than 700 Simple Recipes and Techniques to Mix and Match for Endless Possibilities. Over 700 recipes in 300 pages! This recipe came from the section Cabbage +12 Ways. There are four sections: Braised, Raw, Soup, and Stir-Fried. I decided to make one of the raw salads, although I changed it up a tiny bit. I'm spending the year cooking through sections of the book with Wendy of A Day in the Life on The Farm and Camilla of Culinary Adventures with Camilla. It's hard to believe, but we are almost done! This recipe generously served four. If you have leftovers, they will keep nicely in the refrigerator for at least a couple of days. You can also customize this salad by changing the dressing or adding additional ingredients such as raisins or dried cranberries. 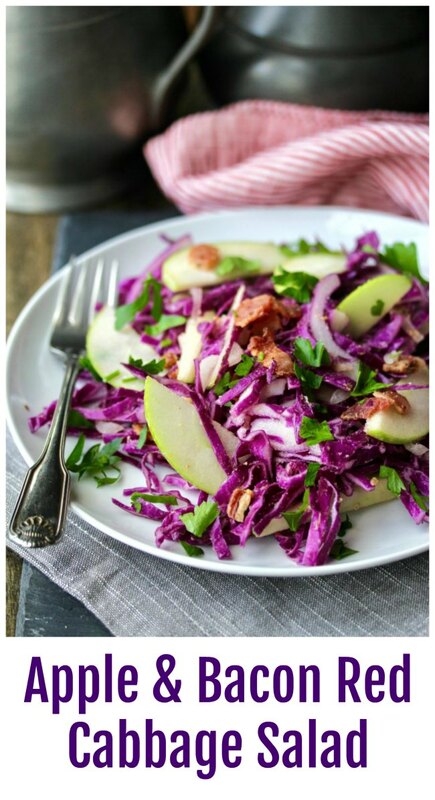 Add the cabbage, pecans, apples, and bacon to a large bowl. In a jar with a lid, add the olive oil, vinegar, mustard, shallots, and black pepper. Shake the jar to mix the ingredients, and pour over the cabbage mixture. Toss the salad in the dressing and garnish with the parsley. 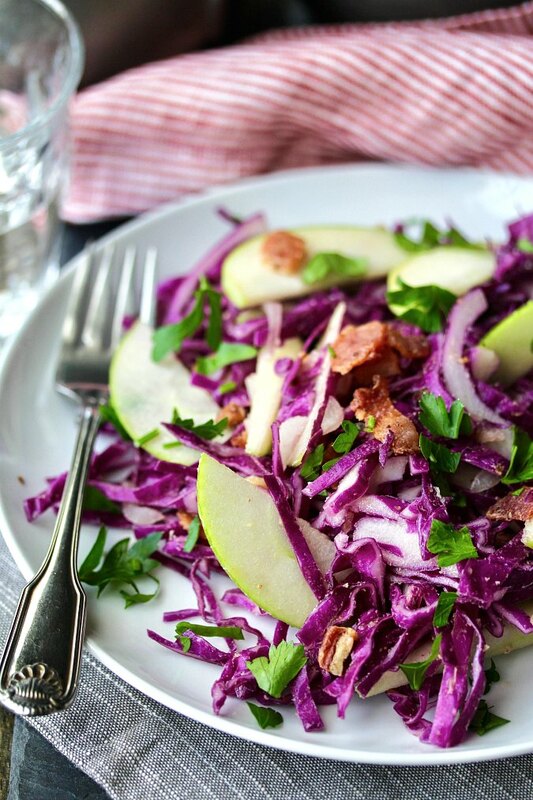 Love this great alternative to Cole Slaw.